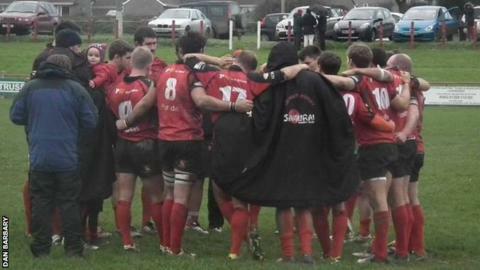 Redruth coach Ashley Morcom has called on his team to deliver a victory in his last home game in charge of the club. The Cornwall side go into the game against Clifton lying 11th in National League Two South, with 62 points. Morcom told BBC Radio Cornwall: "It's not just our last [home] game. It's my last in charge and [coach] Craig Bond's last before he retires, plus two guys are winning their 100th cap. "We've got to make sure we deliver and give the boys the result they deserve." He continued: "It's not going to be an easy game, by any means. But, compared to games we've played at home against the likes of Ampthill, Hartbury and Canterbury, it's a relatively easy fixture. "Hopefully the boys will be raring to go. "It's a pretty special day all round." Morcom announced his decision to stand down in February and will be replaced next season by Steve Larkins. Redruth are just four points above the relegation places with two games to go. "The last thing I want to do is have to go to Cambridge needing to get a win up there. "It's important that we get the result this weekend. All we can worry about is ourselves."